a) Stress state in the vicinity of a planar crack as it approaches a spherical inclusion embedded in a linearly elastic matrix and subjected to a remote tensile loading perpendicular to the fracture plane. The left and right figures correspond to an inclusion three times stiffer (E* = Esphere/Ematrix = 3) and three times more compliant (E* = 1/3) than the surrounding matrix, respectively. The Poisson's ratios of the sphere and matrix are equal (0.30). b) A time sequence of video images shows the rupture of a microcapsule and the release of the healing agent. A red dye was added for visualization. The elapsed time from the left to right image is 1/15 s. Scale bar, 0.25 mm. 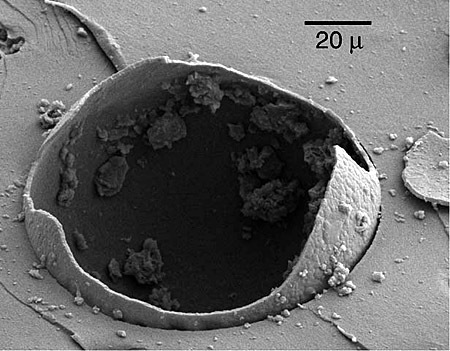 c) A scanning electron microscope image shows the fracture plane of a self-healing material with a ruptured urea-formaldehyde microcapsule in a thermosetting matrix.